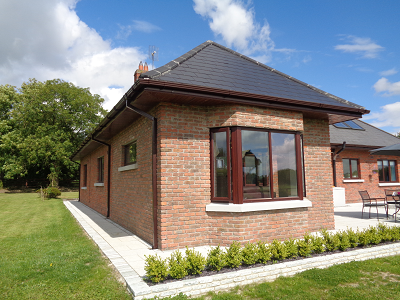 In July 2015 CK Architecture was contacted by a family in Kilcloon. The couple and children had recently purchased a 2-storey bungalow that they were willing to extend at ground floor and to refurbish. 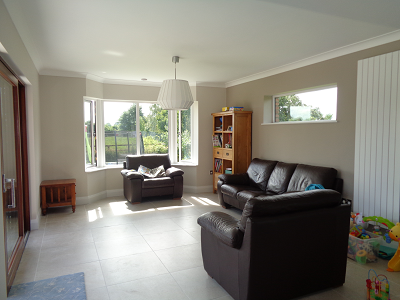 The extension was needed to provide a sitting area within the existing kitchen / dining room. the dwelling first floor layout was not designed to suit the needs of the new owners who were looking for an additional first floor bedroom within the existing perimeter of the dwelling. 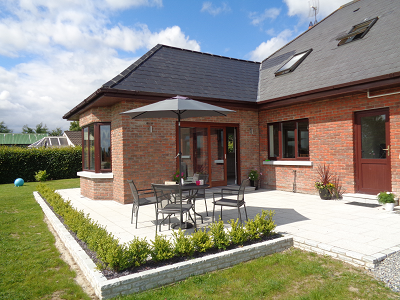 The property landscaping was somewhat unfinished and the new owners were looking for a patio to be created with the extension at rear. The new owners had no preferences in respect of the extension aesthetics and they were looking for advises in respect to size and style. One of the requirements was to keep the house extension design and internal works within the regulations for developments exempted from planning permission. The detached property has a large rear garden. It is located in a rural area and was recently connected to the public sewers while a septic tank was decommissioned on site. The rear garden is orientated South-West offering a wide range of possibilities for the extension design. The clients followed our advises when we recommended an extension to match the style of the existing dwelling to appear as if it was built with the dwelling. We proposed a bay window to the rear of the extension to match the dwelling front facade. At first floor the large landing area was partitioned to create a new bedroom and a storage room. The proposed bedroom was equipped with a roof window to fulfill the role of a fire rescue access in compliance with Section 1.5 from Part B of the Building Regulations 2006 for fire safety. A new fire detection alarm system was proposed, with new floor finishing, a new entry door, new lighting and electrical layout and landscaping works... The new kitchen units were designed by others. Following the tender and the appointment of a contractor in December 2015, construction works started in January 2016. CK Architecture acted as the PSDP (Project Supervisor Design Stage). We also enforced compliance with the contract, carried out regular inspections during the works, instructed the contractor and issued an opinion for compliance at completion. An Eco-drain pipe exposed during the works had to be relocated. The clients asked for the extension attic space to be floored and insulated with PIR insulation in order to facilitate storage at this location. These were some of the contract variations during the works. A landscape contractor and a kitchen contractor / manufacturer were appointed independently from the main contractor, who was in charge, with his sub-contractors, of the remaining parts of the works. The works were completed during May 2016.